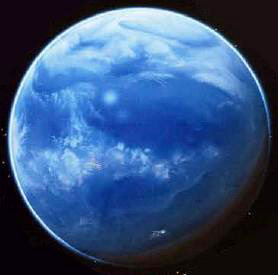 Seen from space, the planet Mon Calamari (also known as Dac) appears as a tranquil deep blue orb with few landmasses. Despite the inherently peaceful nature of the native species that shares its name with the world, the endless oceans have been stained by bloody war on many occasions. Two aquatic species have struggled for dominance on Mon Calamari for ages. Though the conflict has subsided in the face of greater external threats, neither the Mon Calamari nor the Quarren will ever forget the violence that has marred their histories. The Mon Calamari developed as coastal dwellers, living comfortably in both the water and on the surface. The Quarren lived in the depths, only surfacing on rare occasions and with great difficulty. The Mon Calamari developed culturally and technologically while the Quarren trailed behind as primitive savages. Contact between the two species was sporadic, and almost always violent. The aggressive Quarren grew to hate their strange world-mates, and would strike from the depths repeatedly. The more advanced Mon Calamari had the means to deflect such strikes time and again, but could not determine how to make the Quarren stop. Thus, centuries ago, the Mon Calamari embarked on a bold and controversial experiment. They abducted a generation of Quarren children from their parents, and raised them instead. They uprooted the primitive Quarren society, and attempted to civilize the people from the deep. It worked, after a fashion. The new generations of Quarren did not seek to make war with their neighbors, but since those days, many have always harbored resentment against their more sophisticated cousins. The newfound cooperation between the Mon Cals and the Quarren proved to be a boon to the planet. The Quarren were skilled miners, drawing precious ores from the ocean floors. The Mon Calamari were able starshipwrights, building majestic vessels to ply the local spacelanes in exploration. The Mon Cals were dreamers, with their heads in the stars. The Quarren were pragmatists, with their heads deep below the oceans. Though a small number of Quarren undertook a few scattered colonial ventures to get away from the oceans, the species as a whole had no interest in joining the galaxy at large. When the Republic discovered Mon Calamari, it was the Commerce Guild that took the most interest. The mineral assets of the planet were most attractive, and the Guild insinuated itself into the local government. The Calamari Council soon became staffed by Guild-appointees, all of them Quarren mining barons made exceedingly wealthy by graft from the Commerce Guild. With the Quarren basically in charge of the planet, they put a chokehold on the burgeoning Mon Calamari space program, enacting a policy of isolationism that kept the planet in interstellar stagnation for decades. The outbreak of the Clone Wars split the planet into civil war. The corrupt Quarren, Senator Tikkes, sought to bring his world into the Separatist fold, but he was censured before he could do so. A loyalist Senator, Tundra Dowmeia, was installed in his wake, but he could not keep Separatist-sympathies quiet among the Quarren. A radical movement, the Quarren Isolation League, sought to rid the oceans of any Republic presence. The local Mon Calamari Knights took up arms to stop them. Coruscant answered by sending General Kit Fisto to help the Knights, and together, they were able to bring Mon Calamari back into the Republic fold. The transition was uneasy. The Mon Calamari Council was reformed, and the Separatist-sympathizers were ousted. The planet would now be jointly represented in the Senate by Mon Calamari and Quarren interests. As the Republic underwent transformation under Palpatine's New Order, the Mon Calamari were finally able to open up their world to the rest of the galaxy. They ran straight into the Galactic Empire. An Imperial task force arrived at Mon Calamari, looking to garrison the world and its shipyards, and enslave the people of the ocean world. As a show of power, the Empire destroyed three Mon Calamari cities from orbit. It has long been rumored that a bitter Quarren collaborator was responsible for the lowering of planetary defenses. The Empire failed to occupy the planet, however. The Mon Calamari and the Quarren joined together to fight back against the invaders. They were able to repel the Imperial invasion, making it more costly to the Empire than it was worth. The Mon Calamari were soon to join the Alliance to Restore the Republic, committing their shipyards to construct mighty warships for the growing Rebellion. After the defeat of the Empire, Mon Calamari became one of the charter members of the Alliance of Free Planets, and the New Republic that followed. Protection of the world was the responsibility of the Mon Calamari Defense Forces, staffed by Mon Cals and Quarren alike. Though many Quarren secretly believed that war came to their world due to the Mon Cal venturing into dangerous waters, the planet enjoyed peace for a few years. Then, during the resurrected Emperor's campaign of terror, the oceans swelled with blood again. The Empire finally struck back against Mon Calamari with their new engines of destruction, the World Devastators. The massive floating weapons attacked the planet's southern territorial zone, ravaging the cities of Kee-Piru and Heurkea. The Battle of Mon Calamari became a pivotal conflict in the war against the cloned Emperor, and though the planet survived, it took years for Mon Cal ecologists to restore the world to its pre-war splendor. Years later, during the height of the Yuuzhan Vong war, and following the collapse of the New Republic, Mon Calamari became the seat of government for the newly formed Galactic Alliance. Aside from the Mon Cals and the Quarren, the planet is home to a rare species of aquatic leviathan called the Whaladons. The massive cetaceans are intelligent, though they possess no technology. Another peculiar resident of the depths is the Mon Calamari Knowledge Bank. They are a bizarre community of intelligent bivalve mollusks with incredible memories that somehow retain the entire history of the planet. Non-intelligent life includes krakana, keelkana, choarn, lampfish, and flailers.